LIVALL Bling Helmet is smart because it has built-in Windbreak Mic, 3-axis G-sensor, Bluetooth Speaker and LEDs on the top and back of the helmet. All these things together make Bling Helmet extraordinary. The history of the bicycle can be traced back to the 1790s. After more than 200 years of development, cycling has gone from a daily transportation method to a lifestyle, and even a culture. When cycling, safety and enjoyment are most important to cyclists. In many countries, out of safety concerns, wearing a helmet has become mandatory, and LIVALL aims to provide cyclists a SAFER yet MORE JOYFUL experience. 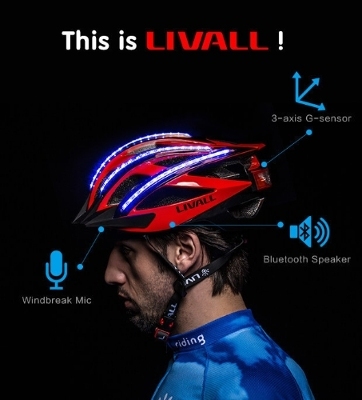 LIVALL is the first smart helmet in the world that integrates communication, music, and smart lighting. With built-in Hi-Fi Bluetooth speakers and microphone, Bling Helmet enables cyclists to answer phone calls, allowing them to stay connected. For communication during group riding, LIVALL has developed a Walkie-Talkie function to make it easier for team members to communicate with each other. Unlike traditional helmets, LIVALL not only minimizes unexpected damage, but also will send SOS alerts to emergency contacts via the LIVALL Riding App when the built-in 3 Axis G sensor senses an external strike. To prevent accidents, LIVALL has LED outline lights on top of the helmet for better visibility, and LED tail lights to send out turning signals. To warn pedestrians and drivers, all cyclists need to do is use a single finger to press the "<" or ">" button on Bling Jet (remote control) on the handle bar. During the ride, cyclists can use the LIVALL Riding App not only to control the tail lights but also to use other functions to easily play music, take photos/videos, etc., through Bling Jet. In addition to LIVALL Nano Cadence Sensor, the smallest single unit cadence sensor in the world, the LIVALL Riding App can also perfectly sync with other smart wearable devices like smart watches or pedometers to present the data to cyclists and help them better improve performance. Also with the power bank inside LIVALL Phone Holder, there is no more need to worry about the phone running out of battery. The LIVALL team has completed R&D and the production trial in March 2015. In May, phone application beta testing and R&D of the overseas version were completed. The helmet is currently on crowdfunding site Indiegogo, where it has raised over half of its goal within the first 12 hours. Throughout this campaign, LIVALL hopes to bring its intelligent product and pleasant riding experience to more cyclists globally. 0 comments on "LIVALL is the first smart and safe cycling helmet"